Environment Agency Fisheries Enforcement Officers patrol North East waters in rod licence crackdown. More than 400 North East anglers had their rod licences checked in a Bank Holiday blitz on illegal angling. 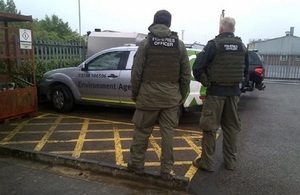 Environment Agency Fisheries Enforcement officers were out on patrol and acting on intelligence to seek out those fishing without a licence. They made 369 first time checks on anglers right across the North East, and 40 repeat checks of anglers who officers have previously seen on our river banks and stillwaters. Of the 409 checked, seven men were reported for unlicensed fishing; six at stillwaters at Derwent reservoir near Slaley and Fontburn reservoir south of Rothbury, both in Northumberland, Grassholme reservoir near Barnard Castle in County Durham, and Aldin Grange near Durham city. One was reported on the River Tyne near Ovington. Patrols were also carried out on the River Tees, Wear, Tyne and Coquet. It’s good news to see that the vast majority of those enjoying fishing on our great rivers and stillwaters in the North East have a licence. It’s the small number of anglers who cheat others by not buying a licence who we will continue to target. The money they pay for a rod licence goes back into supporting fishing and fisheries. Those who flout the law are undermining others and endangering fish stocks and the future of the sport, as well as running the risk of a criminal conviction and fine. We’ll continue to work closely with angling clubs and police to gather intelligence about illegal fishing, and respond to reports from the public. The Bank Holiday blitz comes after 18 people were reported for a variety of offences in the North East during a four-week summer season crackdown in July and August. Anyone fishing illegally can expect to be prosecuted and face a fine of up to £2,500 and up to £50,000 for byelaw offences. Last year, the Environment Agency checked over 62,000 rod licences and prosecuted more than 1,900 anglers for rod and line offences resulting in fines and costs in excess of £500,000. Fishing is great value for money at just £27 for an annual licence, and concessions available. Buying a rod licence is quick and easy - you can buy them online at the Post Office, at your local Post Office branch or by phoning 0344 800 5386.